The project to open a park on the top of Beechen Cliff started in 1896 when a proposal to acquire the land was first discussed at the Council’s Pleasure Grounds Committee. About that time the owners of Holloway Farm were considering developing the land for housing. Nothing however was done until 1898 when it was agreed to investigate the cost of buying the land and building a public park or cliff drive or both. In August of that year the Council agreed to purchase a field of 11 acres on the highest part of the cliff together with a right of way over the new road (now known as Shakespeare Avenue) then being constructed from Wellsway. The cost of the land was £2750 with a further £1250 set aside for laying out the park and building the road around it. As the Bath Chronicle said at the time of the opening ‘it would be difficult to find in any part of England a short drive so near a city in which so wide and varied and beautiful a series of views is disclosed to the visitor’. Some of those views are still visible, other partly obscurred by trees in and around the Park, by adjacent houses and by Beechen Cliff School. 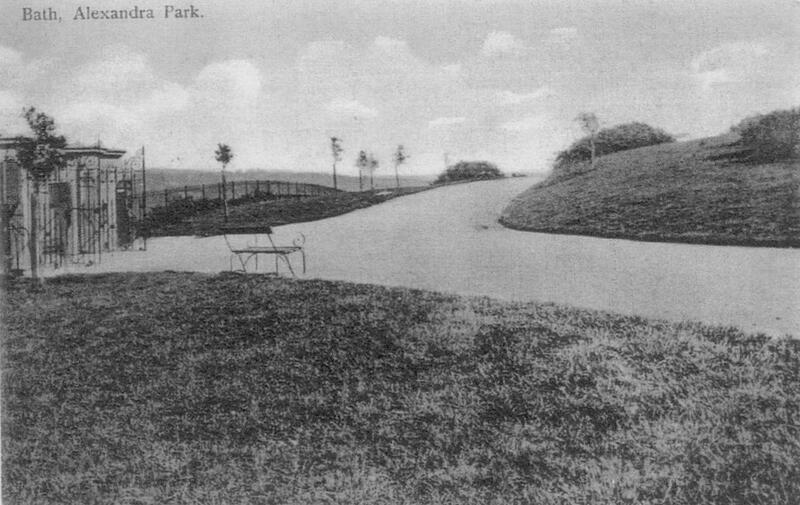 The opening of Alexandra Park was to have been part of Edward VII’s coronation celebrations but these were postponed because of his illness. The Council decided that the Park was too important to be left unused and so after a delay of a few days, the gates were unlocked and it was opened by the mayor and an oak was planted.